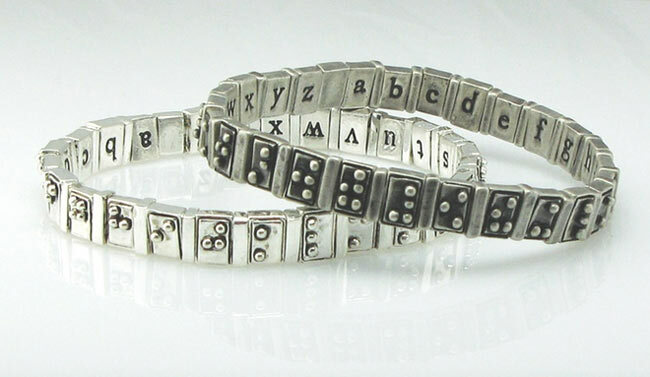 This award winning Alphabet Bracelet for blind people to learn braille was designed by Leslie Ligon. Leslie designed the bracelet for her blind son and has just won a coveted People’s Design Award from the Cooper-Hewitt National Design Museum. The simple design allows a blind person learning braille to keep the bracelet close at hand and touch the dotted alphabet to learn whenever suits. Where only ten percent of legally blind people in the US can read Braille yet “at least 90 percent of the blind that hold jobs are Braille literate.” Hopefully this simple device will help teach braille and reduce these stats over time. The Braille Bracelet is available to purchase from the National Braille Press for around $40.